Diddanwyd y gwestai ar ôl bwyd gan y rhedwr tywys Steffan Hughes. Guest were entertained by the Paralympic guide runner Steffan Hughes. We are very grateful for his willingness to give up his time to entertain and inspire the students and guests. "..would like to congratulate all involved in putting on a fantastic evening, last Friday. We enjoyed the relaxed and friendly atmosphere between the staff and guests, we thought all the pupils taking part from the car park attendants to the waiters, waitresses and washer ups were a credit to the school. 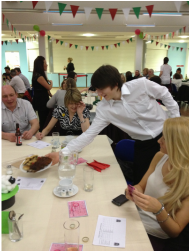 A special thank you to all the students who were responsible for putting together the excellent 3 course meal that started the evening off brilliantly"
"Just a brief note to say a big “well done” to all the staff and pupils for a brilliant event on Friday – everything exceeded my expectations – an enjoyable evening, great food, inspirational speaker and a fun fundraising event!! "I’d like to particularly single out for praise the BTEC students who catered the event – they produced excellent food and I am certain that the addition of this event to their portfolio and their CV will help them to secure future education and employment opportunities – they shone!!" "I feel compelled to write to you to say how very much we enjoyed the meal and auction last night. It was a superbly organised event, and I think that as a school, you should be very proud of all the children who worked so hard to make the evening go so smoothly"
"I just wanted to thank you and your colleagues/friends for a fantastic evening tonight. We had a lot of fun. It had all the right ingredients and it will stay a memorable evening for us parents and the boys and girls"
Os oeddech methu mynychu'r noswaith ond hoffwch gyfrannu i'r achos byddai wir yn cael ei werthfawrogi.